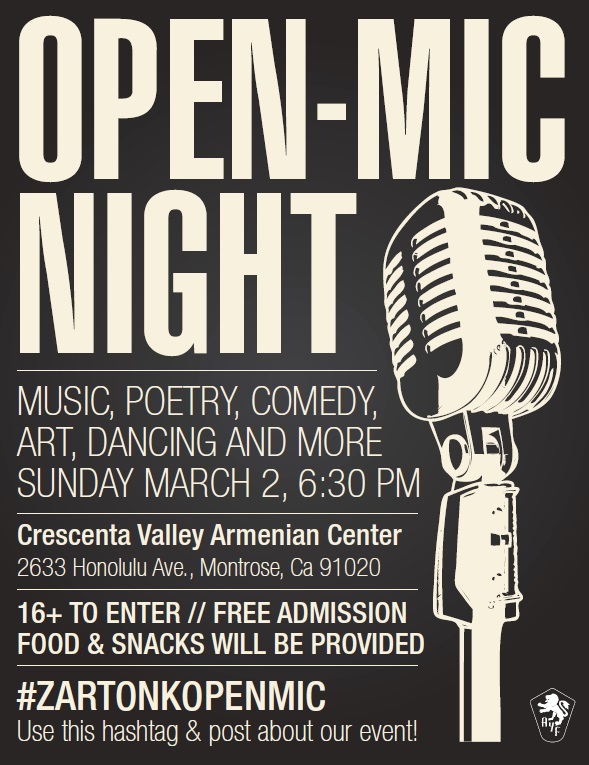 The Armenian Youth Federaton Crescenta Valley “Zartonk” Chapter’s annual Open Mic Night will be held this Sunday, March 2, at 6:30 p.m. at the Crescenta Valley Armenian Center located at 2633 Honolulu Ave., Montrose, CA 91020. This community event aims to present talented artists, dancers, writers, actors, and comedians in an intimate and vibrant environment where they can showcase and perform their work. Community members over the age of 16 are encouraged to attend and perform. Last year’s Open Mic Night had over 20 performers and artists. This year, the “Zartonk” Chapter is happy to announce a total of 30 confirmed performers and artists. The chapter is excited to showcase new individuals eager to share their talents with the community. For any questions, or if you would like to perform, please contact zartonk@ayfwest.org. Burbank, CA – The Armenian Youth Federation Burbank “Varak” Chapter hosted its second annual Art Exhibition on Feb. 22 at the ACF Burbank Youth Center. 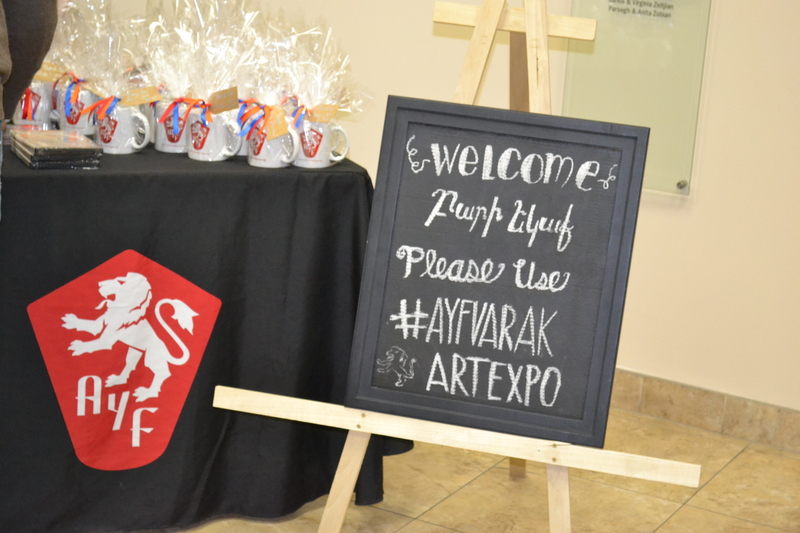 The event, which was free and open to the public, brought local artists together with their community to celebrate the Armenian culture through art and allowed the hard work of the artists to be recognized in an intimate setting. “The night was brilliant. We had phenomenal art by talented local artists of all ages, a live band, and a traditional Armenian dress up photo booth. The best part is, all of this was free and open to the general public,” said Paulina Safarian, a member of the “Varak” chapter. 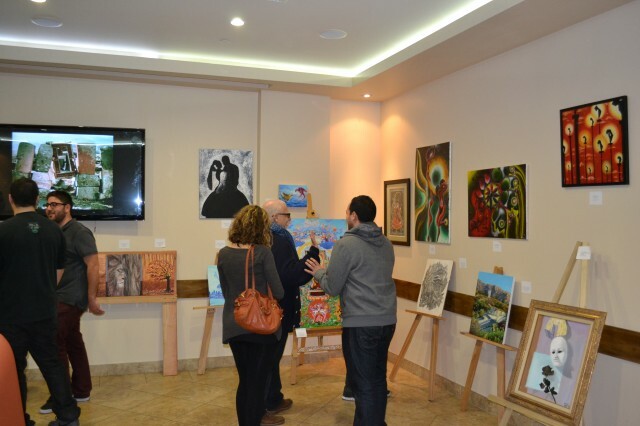 One of the guests, Stella Boghozian, also expressed her pride in being able to see a local art exhibition. “Artists are often forgotten in our communities, so I was so excited to see the various works displayed, and the passion artists showed when describing their work,” she said. 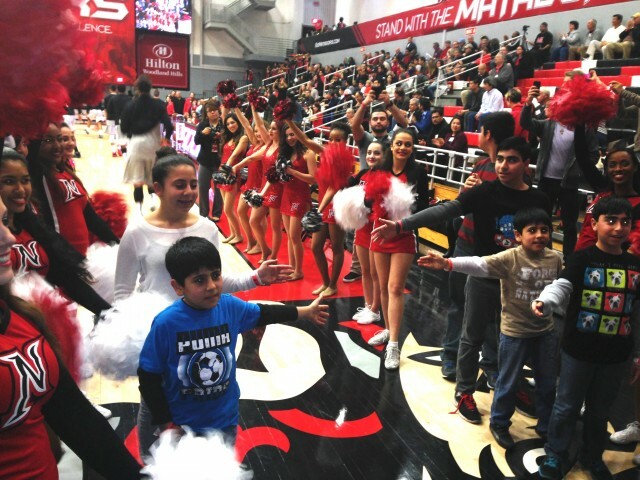 Northridge, CA- On Feb. 8, the AYF San Fernando “Sardarabad” Chapter invited athletes and parents of the Special Needs Basketball Program to witness the Cal State Northridge Matadors take on the Cal State Fullerton Titans in a Big West showdown. The excitement began as soon as the athletes walked through the door. Thanks to Erin Kiser, the Assistant Athletic Director at CSUN, the athletes were able to welcome the CSUN Men’s Basketball team onto the court alongside the Matador cheerleaders. 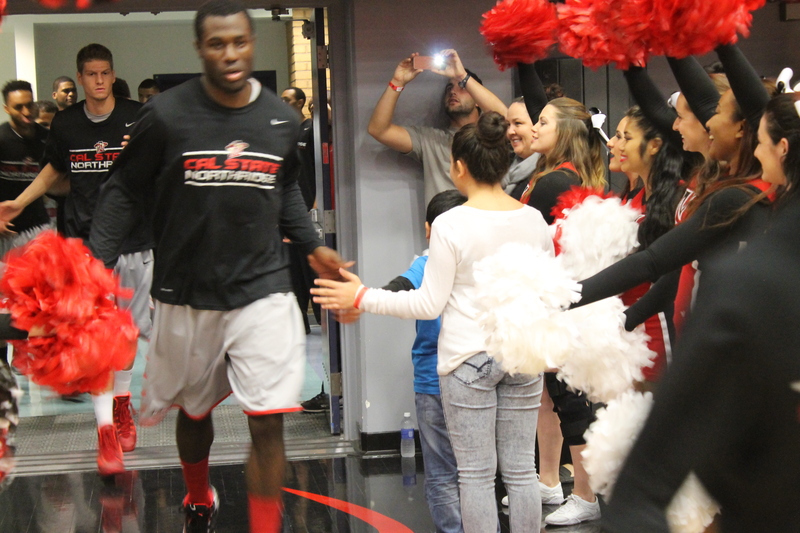 The game was a roller coaster ride for the Matadors with great display of heart and will. With two seconds left on the clock, the Matadors tied the game with a three point shot that brought joyful cheers to both the athletes and parents. In overtime, the Matadors out-battled the Titans to victory. The greatest joy of the night was seeing smiles on children’s faces when a player dunked the basketball and feeling the excitement when they chanted “Defense” with the other Matador fans. Saturday night’s energy carried into Sunday, as the AYF Special Needs Basketball Program held its weekly basketball practice. The athletes, parents and volunteers continued to have fun and bond through the beautiful game of basketball. For more information about the Special Needs Basketball program, call 818-451-3787 or email sardarabad@ayfwest.org. The Armenian Youth Federation hosted several drives this past holiday season. Local chapters collected items such as canned food, clothing and toys in order to help the less fortunate in Armenia, as well as their respective communities. The Pasadena “Nigol Touman” Chapter held its first-ever canned food drive. 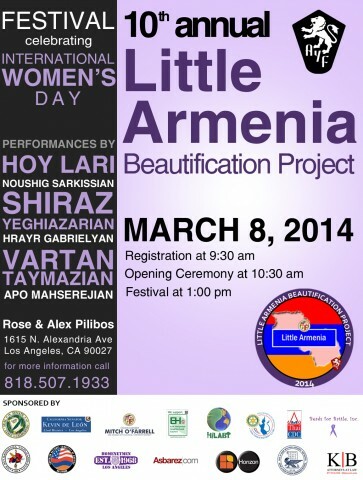 Donations were collected at the Pasadena Armenian Center and sent to the Pasadena Union Station and Homeless Shelter. In Fresno, the “Kevork Chavoush” Chapter collected toys to be sent to Armenia in their sixth annual toy drive. Each year, the chapter reaches out to local Armenian and non-Armenian businesses to place drop-off boxes in their facilities. This year, with the help of the Burbank “Varak” Chapter, they collected further donations in the Greater Los Angeles area. For the tenth consecutive year running, the Armenian Youth Federation (AYF) is mobilizing youth throughout California for a massive one-day effort to beautify the streets of Little Armenia in Hollywood. 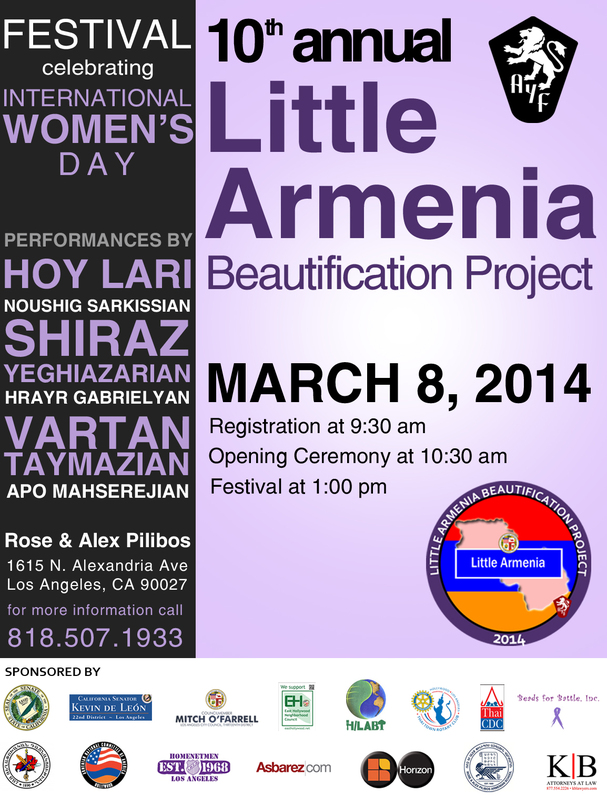 On March 8, the 10th Annual Little Armenia Beatification Project (LABP) will kick off in the courtyard of the Rose and Alex Pilibos High School on Saturday morning, where there will be a festival. Hundreds of volunteers are expected to partake in this year’s project. The event, organized by the AYF Hollywood “Musa Dagh” Chapter and the Hollywood chapter of the Armenian National Committee of America (ANCA), helps revitalize the streets of this densely populated district of East Los Angeles. The AYF took on the project after the official designation of “Little Armenia,” as it is home to more Armenian-Americans than any other city in America. For many years, former Los Angeles City Councilmember and current Mayor Eric Garcetti and California State Senator Kevin de Leon have been avid supporters of LABP. Over the past 10 years, according to Los Angeles Sanitation Department estimates, the Project has resulted in the collection of more than 40,000 pounds of trash. This year, through the office of L.A. City Councilmember Mitch O’Farrell, the city will once again be donating supplies including rakes, brooms, shovels and garbage bags. In an effort to continue to growth and reach of LABP, the AYF has also teamed up with the East Hollywood Neighborhood Council, the Rotary Club of Thai Town and the Thai Community Development Center. In addition, the AYF has chosen to make the official color of the event purple in solidarity with International Women’s Day, which also falls on March 8. The Armenian Youth Federation Burbank “Varak” Chapter is excited to announce its second annual art exhibition to be held on Saturday, Feb. 22 at 7 p.m. at the ACF Burbank Youth Center, located at 75 East Santa Anita Ave in Burbank. The event aims to bring the community together to promote and celebrate Armenian culture. All members of the community are invited to participate and showcase their artwork. Paintings, drawings, photographs and sculptures will be accepted. Last year, over 75 pieces of art were showcased in the exhibition. 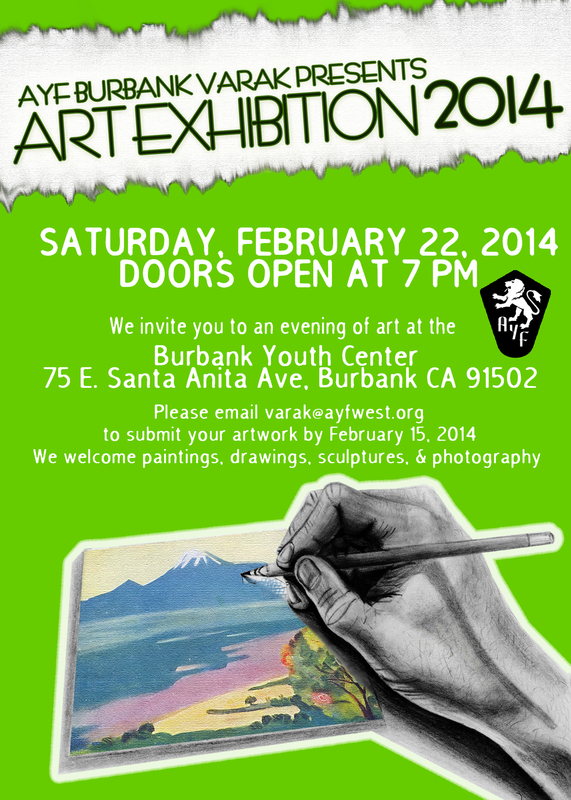 The Burbank “Varak” Chapter is looking forward to showcasing even more artwork by more artists this year. To submit artwork, please use the online sign-up form. Admission to the event is free and open to the public. For any questions, please contact the AYF Burbank Chapter at Varak@ayfwest.org. The AYF Mentorship Program is a newly-initiated program that helps members achieve their academic and professional goals. Partnering with the Armenian National Committee – Western Region and the ANCA – Professional Network, this program will be leading the Armenian youth toward academic success. Each applicant is matched with a qualified mentor who will guide and advise the mentees through various parts of their academic career. The mentorship accommodates every mentee’s needs. 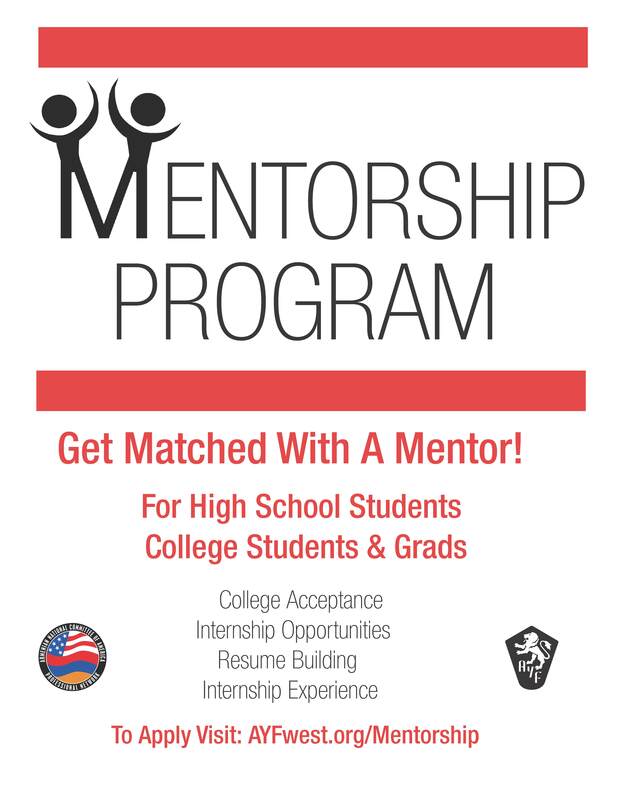 Mentors give direction and provide resources to their mentees in areas such as college applications, essay revision, resume building, internship opportunities, post-graduation job searching, resume building, and any other accommodations. Mentors are also encouraged to meet in person with their mentees and have guidance sessions. AYF members across the Western Region are encouraged to apply to the program as mentees and mentors to younger members. On Jan. 31, Armenians across the world took to social media sites such as Twitter, Facebook and Instagram in order to publicize the Armenian Genocide. The campaign was successful in trending the hashtag, #ArmenianGenocide, in several countries. The objective of the campaign was to bring light to the issue of the Armenian Genocide outside of the month of April. Participants were encouraged to compose informative messages along with the hashtag in order to educate the social sphere about the horrors of 1915. Spearheaded by Armenian Youth Federation members across the United States and Canada, the online movement was paired with silent protests in university campuses across California, organized by the All-Armenian Student Association. Students taped their mouths shut with duct tape and displayed posters in order to bring attention to themselves and create awareness about the genocide through informative posters and displays. 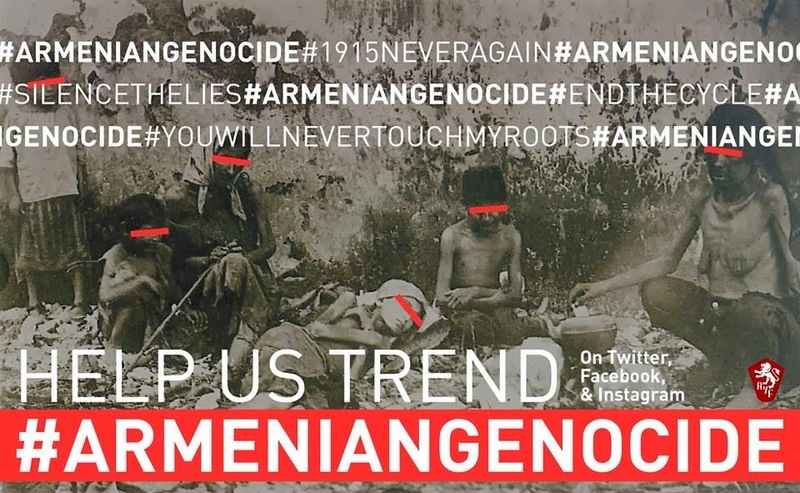 The social media campaign garnered the most attention on Twitter, generating 16,715 tweets containing the #ArmenianGenocide hashtag on Thursday. It was the third-most tweeted trend in the United States for about 10 minutes and fourth-most in Canada between noon and 1 p.m. The hashtag was most used in Los Angeles, trending at No. 2 between noon and 2 p.m. and No. 3 between 2 and 3 p.m. It was also No. 7 in Washington, D.C. for over an hour. The hashtag was popular in several other locations, including Austin, TX; Toronto and Montreal in Canada; Armenia; and Egypt.